One of the early settlers in Preston was Haji Abdullah Musa Dhanbhai. He came to Preston from Karmad in 1957. He passed away on 1 January 2012. He was the founder of Abdullah Musa Halal meats in the 1960s, which is now run by his grandson. He was accompanied by Isa Mirawala, also of Karmad, in the same ship. Muhammad Hasan Patel of Kahan also arrived in Preston in 1957. Hasan Master of Sansrod and Ahmed Veragi of Rajpardi settled in 1958. In 1959, Mastan Bangalawala of Tankaria, Vali Munshi of Pariej and Muhammad Karkun of Paguthan came to settle in Preston. Bharuchi Vahora Patels who came in 1960 include Ahmed Voraji and Ayub Karim of Tankaria, Ibrahim Bhailok and Muhammad Mirawala of Karmad, Ibrahim Badin of Manubar and Adam Musa Kasamri of Valan who worked on the trains from Preston train station and also had several shops. He was originally the secretary of the village and best friends with Daud Chaka and contributed a lot to Valan hospital, the school etc. Also included among the earliest settlers to Preston are the Matliwala family, Vaza family, and the Habib Brothers family who migrated in the early 1960s and they were one of the earliest settlers from the community (hence, they are very well-known in Preston and Lancashire). The Deepdale and Frenchwood areas are where most settlers initially migrated to; whereas now, the very large community can be found all across the Preston district, such as the exclusive Victorian area of Fulwood, and other villages near Preston – this shows how progressive the community in Preston is. Today, however, the Deepdale area in Preston has a majority Bharuchi Vahora Patel population. The early migrants worked in factories and mills. Later they started their own factories. The Matliwala brothers of Karmad, the Vaza brothers of Vahalu, the Dasu family (Police Jeans) and Habib Brothers of Kantharia started garment factories. The Bhailok family of Karmad are in property development. Usman Salia of Kamboli also deals in properties and has an export-import business. Many Bharuchi Vahora Patels are owners of grocery and newsagent shops. a) Matliwala /Bux Brothers, who own the extremely successful Voi Jeans – they have a very large presence in the country, and are soon going to be an international brand (www.voijeans.com. The Bux Brothers are probably one of the wealthiest Vahora Patel families in the North West now. b) Vaza – as mentioned before, they were one of the early settlers and owned a factory. They also built and funded one of the earliest mosques in Preston, Masjid-E-Salaam, Fulwood (www.masjidesalaam.org.uk). c) Habib Brothers family which now run a large chain of 15+ pharmacies in the North West – they provide employment for several hundred young adults from the Vahora Patel community, under the name HBS Group /HBS Pharmacy. They also built the multi-million pound Issa Medical Centre in Deepdale, which is the largest medical centre in Preston. d) Bhailok Family – the family are in property development, as well as being widely involved in local activities. Their renowned son, Yousuf Bhailok, has served as the Honorary Secretary of the Muslim Council of Britain. All of the above families are hugely philanthropic, and thus their presence in Preston is highly respected – this can be confirmed by anyone in Preston; doctors, businessmen, Imams and others. Among the young generation, there are accountants, dentists, doctors, pharmacists and solicitors. Mohammad Vadiwala’s Mohammad and Co; Babar and Co and Bhailok Fielding are reputed solicitors firms. There are three masjids and six madrasas managed by Bharuchi Vahora Patels. Bharuchi Vahora Patels are also associated with three community centres. Masjid-e-Raza is the first purpose built masjid of Preston. Jamia Masjid and Quwwatul Islam Masjid are the two oldest masjids. Masjid-e-Noor and the attached community hall are managed by the Gujarat Sunni Muslim Society. Mubarak Ghantiwala of Nabipur is the President and Hafiz Ismail Khandu of Tankaria is the Secretary. The Noorani Education Centre in the Fulwood area is also under Bharuchi Vahora Patel management. Ismail Vali (Bhagat) of Pariej is its President. Bharuchi Vahora Patels also manage the Madni Centre, which is a part of the Mohaddis-e-Azam mission. Preston Muslim Girls School, which has now become a state funded school, was also established by Bharuchi Vahora Patels. Abrar Academy is another Muslim school in Preston and there are talks to start a boys Darul Uloom. 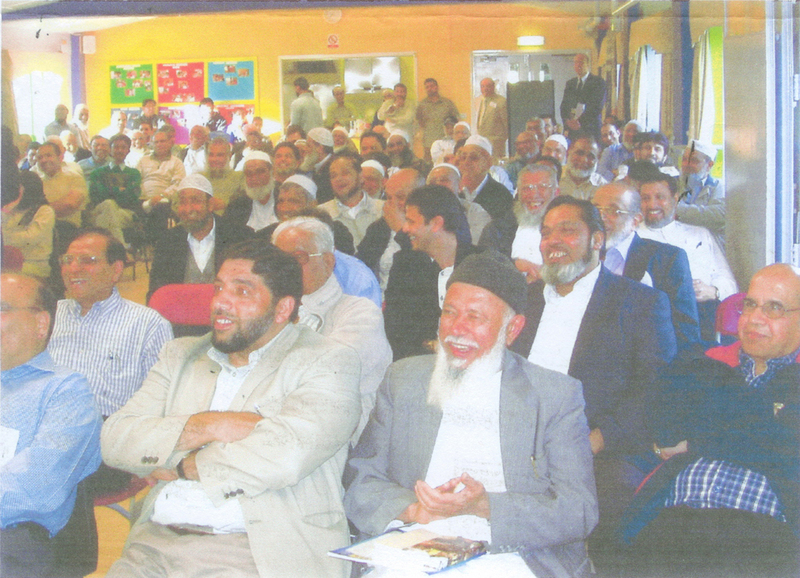 The Gujarat Muslim Welfare Society, Preston organises cultural and social events. Muhammad Amirat is the President of this organisation and Ibrahim Member of Kothi-Vantersa is its founder Secretary. Between them, they successfully organise an annual mushaira and community cohesion programme to promote understanding and good community relations. The presence at these events of the local MP, the Mayor, the Councillors, the Chief Executive of the Council and Police Officers shows how significant they are. Vali Patel of Ikher was the Leader of Lancashire County Council. Ahmed Saeed of Nabipur was the Manager of the State Bank of India. Yusuf Bhailok, who is known as a millionaire businessman, is a prominent public figure with 25 years’ experience of community work. He was the General Secretary of the Muslim Council of Britain for a two year term. Musa Sansrodwala is a social worker and the Vice President of the Bharuch Muslim Medical and Welfare Trust, UK. Gujarati literary activity in Britain first started in Preston. In 1970, the Gujarati Sahitya Mandal was formed at the residence of the writer (Kadam Tankarvi). In 1973, the famous Gujarati poet Shekhadam Abuwala, who lived in Germany, happened to visit Preston. He was invited as a guest poet to a monthly meeting and ghazal mehfil of the poet members of the newly formed Gujarati Sahitya Mandal. At his suggestion, the Gujarati Sahitya Mandal was renamed the Gujarati Writers’ Guild, UK. The writer (Kadam Tankarvi) had been its Secretary until 2004. So far, this organization has held over seventy five mushairas and other literary events. In the words of Adam Tankarvi: “I admire Kadam Tankarvi’s contribution to British Gujarati literature. Since 1961, when he settled in Britain, he has made incessant efforts to keep the Gujarati language alive in Britain. The history of Gujarati literature in Britain cannot be recorded without the mention of Kadam Tankarvi. He has written ghazals, satires, short stories and provided useful guidance to budding poets.” In recognition of his services, he was awarded the Vishva Manvi Paritoshik by the Guild Mayor of Preston and was also honoured by the Muslim Society of Preston and the “BritAsian News” magazine. Kadam Tankarvi’s collection of poems Aavaran (The Veil) and Vedna-Sanvedna (Agony-Anguish) were unveiled in the House of Lords in June 2003. This historical event, organised by Lord Patel of Blackburn, was the very first time that at a Gujarati poetry book was launched in the House of Lords. Kadam Tankarvi is also a pioneer in the field of publication of Gujarati magazines in Britain. He brought out Awaaz (The Voice) in 1970 and when Yakub Patel of Segva started publishing a monthly magazine called Navayug (New Era) from Preston, he became its editor with Imtiaz Patel of Blackburn its sub-editor.